Integrity did an outstanding job. I highly recommend this company. My floors turned out better than I expected. Excellent service ! !Integrity did an outstanding job. I highly recommend this company. My floors turned out better than I expected. Excellent service !! Integrity provided great service, competitive pricing, and delivered our wood floors on time and on budget. Karl is a true professional and very flexible...I changed my mind on the finish and he was very accommodating. I highly recommend this company for all your hardwood needs.Integrity provided great service, competitive pricing, and delivered our wood floors on time and on budget. Karl is a true professional and very flexible...I changed my mind on the finish and he was very accommodating. I highly recommend this company for all your hardwood needs. “I met Karl with Integrity Hardwood already having in my mind what kind of floor I wanted but not able to find it within our budget, Karl said he would do some research. Rather than giving up and kind of letting it “fizzle” (like many have done) he kept at it and found EXACTLY what I had envisioned. He totally nailed it! His team did a great job and are very knowledgeable about the process and the floors. The crew from Integrity Hardwood Floors did an amazing refinish job on our new home. The white oak floors were only five years-old but the finish was badly yellowed with a poor quality product. The refinished floor looks better than new. When integrity was finished, even our painters commented on how clean the house was. They did exactly what their quote said they would, on time and within budget.The crew from Integrity Hardwood Floors did an amazing refinish job on our new home. The white oak floors were only five years-old but the finish was badly yellowed with a poor quality product. The refinished floor looks better than new. When integrity was finished, even our painters commented on how clean the house was. They did exactly what their quote said they would, on time and within budget. Integrity Hardwood Floors (IHF) earns a 7 star rating in my estimation! I have never felt compelled to write a review of any service or product until now. We just had IHF replace some water damaged hardwoods and then sand and refinish all of the hardwoods. The replacement boards blend in perfectly with the original flooring. Karl was professional, yet congenial. He is extremely knowledgeable in the business of hardwoods and installation. He was patient in answering all my questions. He was very flexible, worked within my time frame and budget. He and his crew were prompt, efficient, paying extreme attention to detail. They were conscientious in keeping the surrounding area clean. The newly refinished floors are beautiful...even better than the original floors which had a very glossy finish ... now a smooth, luxurious satin. You can choose glossy if you prefer I think. Karl and his crew were a PLEASURE to work with. HIGHLY RECOMMEND Integrity Hardwood Floors! Karl and his team of professional craftsmen worked their talents and transformed our home. After project began we had concerns about stain or no stain. His team resolved our concerns while maintaining their professionalism. Which incl a birch stain vs natural proved to be a good decision. The project included the stairs to the daylight basement. The custom cuts in the curvature and width improved the safety and they look beautiful. He also helps with referring furniture movers to furniture protection. He demonstrates and provides cleaning products. Great company. Integrity was quick to respond and set up an appointment for estimate. He was timely, polite and knowledgeable. We schedule the work about a 5 weeks out because we had water damage that was still drying out. He checked in on the moisture level and followed up with us as to the next steps. They completed the work while we were on vacation. We were a little nervous about this. There was a thing to worry about. My dad came over and check in with the 2 gentlemen that were completing the work and reported back how efficient they were. Our floors look AMAZING! Better than I had hoped! Customer service BONUS Karl checked in on us about a week later to answer questions we had, go over cleaning and delivered us Bona product. Overall I highly recommend Integrity Hardwood. Karl and the workers for Integrity Hardwood Floors were very easy and pleasant to work with. I got a quote from him in June to refinish our hardwood floors. We told him we were planning on moving back into our house after renting it out for a while. He told us to call him just before we were ready to move back in and they would refinish the floors at that time. We decided to move in before Thanksgiving. Karl scheduled his workers to come in on Friday November 17th. They were so respectful and informative. They did a fantastic job! Karl came in the next day and put the top coats on. The wood floors and finish turned out beautifully. 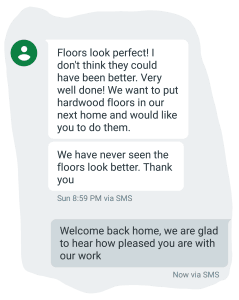 Thank you Karl and to the support staff at Integrity Hardwood Floors!Karl and the workers for Integrity Hardwood Floors were very easy and pleasant to work with. I got a quote from him in June to refinish our hardwood floors. We told him we were planning on moving back into our house after renting it out for a while. He told us to call him just before we were ready to move back in and they would refinish the floors at that time. We decided to move in before Thanksgiving. Karl scheduled his workers to come in on Friday November 17th. They were so respectful and informative. They did a fantastic job! Karl came in the next day and put the top coats on. The wood floors and finish turned out beautifully. Thank you Karl and to the support staff at Integrity Hardwood Floors! Excellent service, excellent technical skills and great to work with. Our new hardwood floor is beautiful. Strongly recommend. Would hire again.Excellent service, excellent technical skills and great to work with. Our new hardwood floor is beautiful. Strongly recommend. Would hire again.